Our aluminum docks do not rot, decay, or twist. Clients love them because they are low maintenance and still look gorgeous for decades. Aluminum docks don’t need time-consuming maintenance or expensive repairs. After building hundreds of docks we’ve perfected a lightweight design that will last you for decades. 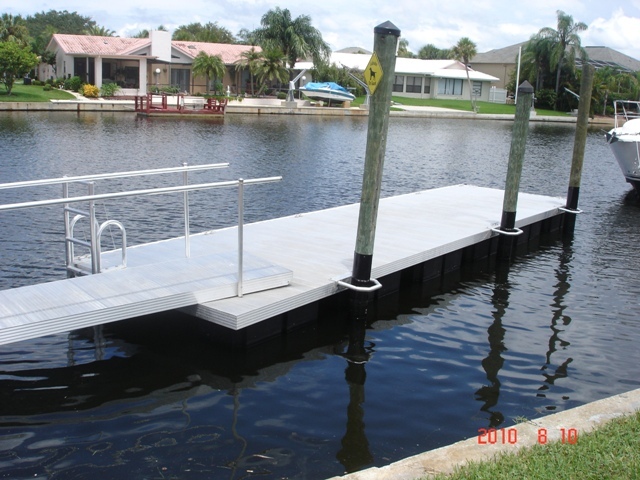 Interlocking 1/4 inch aluminum channel and a 12 inch aluminum deck plank create a stable and timeless dock. The dock’s size, layout, and color will all be based on your personal needs. – DURABLE CONSTRUCTION: Your docks parts have been pre-welded and pre-drilled following the highest quality of materials. – WATERPROOF: Wooden docks can create a host of maintenance issues. Aluminum doesn’t rot, decay, or need extensive care. – NON-SLIP: An aluminum dock doesn’t have a wooden dock’s problems. – CUSTOM DESIGN: The dock’s look and size will be constructed based on your needs, house, and design preferences.